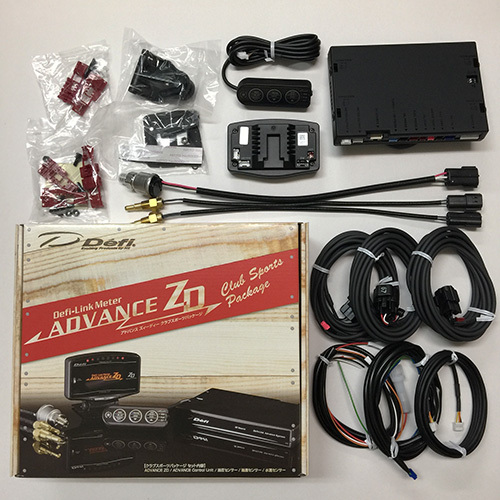 Defi-Link Meter ADVANCE ZD Club Sports Package consists of ADVANCE ZD, ADVANCE Control Unit, oil pressure sensor set, oil temperature sensor set, and water temperature sensor set. ZD CSP (DF09702) : Ended in December, 2011. DF07701 is included. ZD CSP (DF09703) : Released in March, 2012. DF07703 is included. Club Sports Package can be purchased at the set pricing. *To display fuel pressure, exhaust temperature, and differential pressure, sensors and sensor wires are necessary to be purchased separately. *If ADVANCE Control Unit is already installed, purchase ADVANCE ZD and sensors and sensor wires separately. *After Club Sports Package is installed, ADVANCE CR and ADVANCE BF gauges can be installed additionally. Regarding sensor sets, please refer to the sensor page.